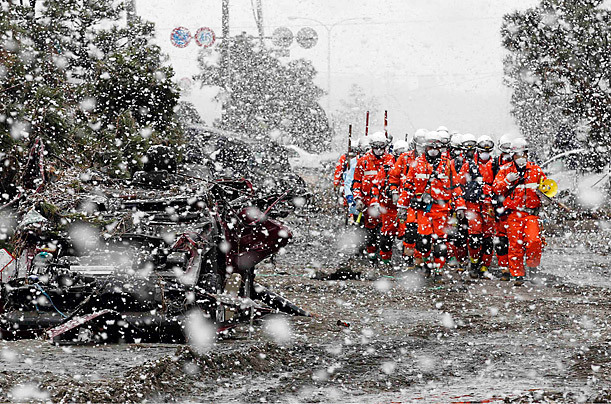 Japanese disaster workers search for survivors. The devastation wrought on Japan by the recent earthquake and tsunami is now being compounded by the threat of a meltdown at the Fukushima nuclear reactors. The humanitarian impact is overwhelming—by some estimates, as many as 10,000 people have likely already perished, and some half a million have been rendered homeless. The Japanese government is struggling to get the situation under control, and international humanitarian assistance is being mobilized in support. The crisis in Japan also serves to illustrate the extent to which the world is increasingly globalized. According to a post at the Financial Times’ Brussels Blog, the European Union is screening Japanese food imports for radiation. While Japanese food exports to Europe are not particularly large—amounting to an estimated 64.8 million euros in 2010—European regulators assert they are acting out of precaution to prevent food contaminated by radioactivity from entering European markets. Then there’s this post by Amy Lee at the Huffington Post. According to Lee, we should expect severe disruptions in global supply chains, particularly for consumer electronics, as a result of the Japanese crisis. Lee notes that Japan is responsible for 14 percent of global production in computers and other consumer electronics. Further, Japan is responsible for the production of approximately 60 percent of the silicon wafers used in the production of the semiconductor chips in nearly every electronic device. Widespread damage to production facilities have already forced many leading producers, including Sony, Toshiba, Panasonic, and Texas Instruments. Damage to Japanese infrastructure may affect exports even after the plants are brought back online. The use of global commodity chains, in which complex products like automobiles or computers are assembled from components produced around the world, has created a system of global production that may be more efficient, but is also more susceptible to disruption. Compounding this, Japan’s perfection of the just-in-time manufacturing method, which reduces costs by keeping inventories low, means that there is little slack in the system. According to Lee, the global consumer electronics supply chain has about two week’s worth of excess stock that will offset disruptions caused by the Japanese crisis. After that, it could take six months for the supply chain to reintegrate. Until then, we can expect to see price increases and shortages for many consumer electronics.